When we started this series of restaurant reviews from a vegetarian angle, we were determined to tell you only about veggie restaurants, or ones with separate veggie menus and plenty of meat-free choice. It makes sense, right? Why give space to venues that are not specifically vegetarian friendly? But then we discovered Salt’n Pepper. This contemporary Pakistani restaurant is the first international branch of a much-loved, long-established chain in Pakistan, where it’s been popular with families dining out together for over 30 years. Tucked away behind the National and National Portrait Galleries, just off Leicester Square, it quietly opened in September last year. Given the quality of cooking, it’s surprising that it’s been under the radar of the majority of restaurant critics and food bloggers. With large windows all the way around to one side, a wooden deck with heated al fresco dining area at the front, and splashes of bright green foliage inside, the low-ceilinged venue has the feel of a conservatory. There are cosy cream-coloured chairs, grey banquettes to sink into, and framed paintings by Pakistani artists and art students. The décor is nothing to get excited about, but it’s bright, neat and comfortable. In fact, we’d discovered Salt’n Pepper earlier this year when we’d popped in for an impromptu lunch that had lingered in our memory for a long time afterwards. Then, after a week of eating in restaurants too mediocre to write about, we decided to return for dinner. We were not disappointed. To say that the restaurant isn’t vegetarian friendly, though, is perhaps a little unfair. 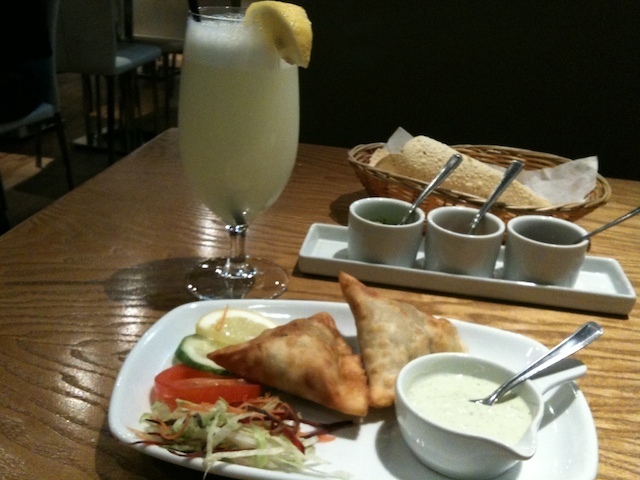 Firstly, Pakistani cuisine itself is very meat-oriented; vegetable dishes generally only have walk-on parts. There are regional influences from veggie-centric India, but also neighbouring Afghanistan, Iran and Turkey where meat is very much central to the cooking. Secondly, while Salt’n Pepper offers ‘only’ three starters, two healthy-option platters, five curries, and a number of breads, rice dishes, raitas, pickles and salads that are suitable for vegetarians, this is, in fact, more than most non-Asian restaurants. True, there are large parts of the menu — especially the barbecue section — that feature no vegetables or even paneer, so we feel we’re missing out, but there’s enough to be enjoyed nonetheless. And enjoy we did. 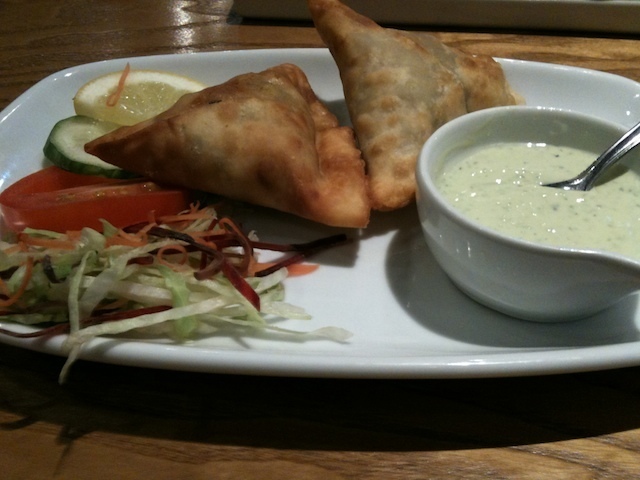 Potato samosas feature neatly diced potatoes, flecked with cumin seeds and coriander leaves, encased in good, thin pastry. Much more refined than the stodgy, greasy specimens filled with indistinct mush that you often find in other mid-range Asian restaurants. This is the only subtly flavoured dish, however. 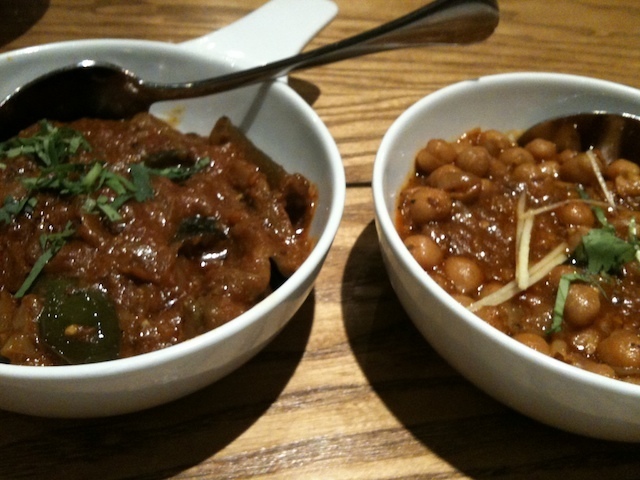 Lahori chana (chickpeas cooked Lahore-style) and achari baigan (aubergines with pickling spices) both pack a punch. The chickpeas are clearly cooked fresh and not from a tin; topped with shredded fresh ginger, they are chilli-hot and assertively spiced yet have a judicious balance of flavours. Whole pickling spices are indiscernible in the aubergines, but the meltingly tender vegetable is cloaked in deeply flavoursome onion-flecked sauce. 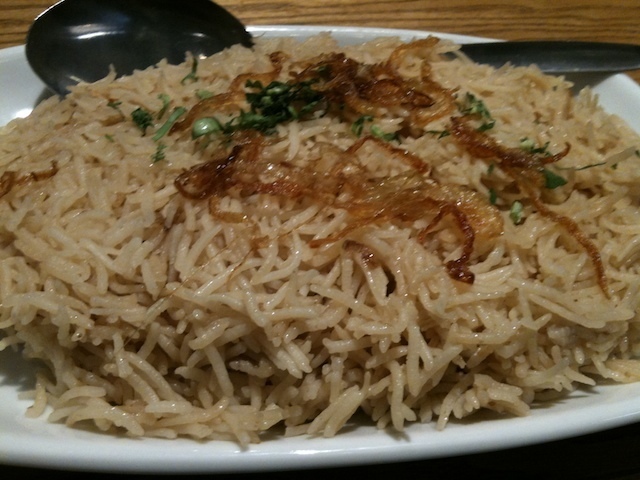 Pilau rice is made with separate grains of rice so long (a highly prized feature in pilaus) that they almost resemble pieces of vermicelli. Coloured pale brown with spices and, unlike many Pakistani pilaus, made without meat stock (we checked), it is topped simply with fried onions and coriander leaves. The dishes here are aromatic, savoury, intensely flavoured yet nuanced. In lesser hands, the use of so many different spices may give the food a cluttered taste and a somewhat murky mouthfeel — but here the homely flavours are clean, rich and elegant. Crisp, flaky roghni naan, a flatbread whose crater-like surface is covered entirely with sesame seeds, is skilfully executed. Even the mint chutney that comes with a basket of cone-shaped papads at the start of the meal impressed with its bright, verdant flavour. Egg and chickpea curry, which we’d enjoyed so much on a previous visit, is no longer available on the menu, which has been revamped and relaunched recently. We finished with one of the restaurant’s few own-made desserts. 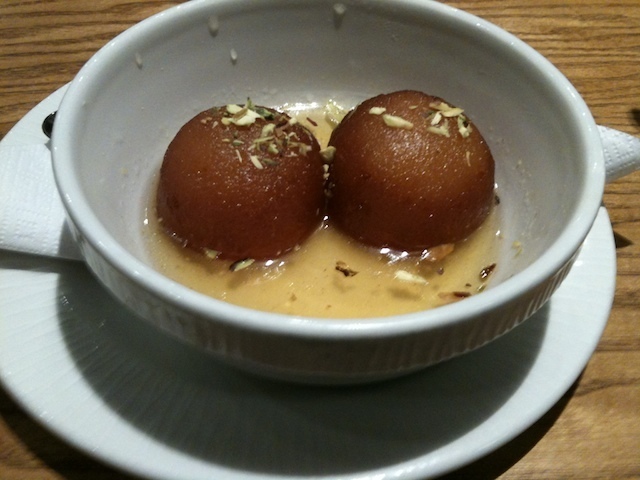 Gulab jamun, which is almost always bought-in in Indian restaurants, is made in the kitchen here. The small, fluffy, feather-light dumplings are stuffed with pistachio nibs, topped with shredded nuts, and served warm in saffron-flecked rosewater syrup. The chefs, who are from the UK, have been trained in Pakistan — and it shows. There’s a list of wine and alcoholic drinks, but we stuck to refreshingly summery, sweet-salty shikanjabeen lemonade. Service is attentive, efficient and professional. When we suggested that the restaurant should offer more and varied vegetarian choices, given its international clientele — currently they centre around chickpeas and potatoes — our waiter took the comments on board, saying he would pass them on to his manager. He added that the manager may, in turn, raise this with the restaurant owner visiting from Pakistan. So that’s another reason we wanted to tell you about this gem of a restaurant. 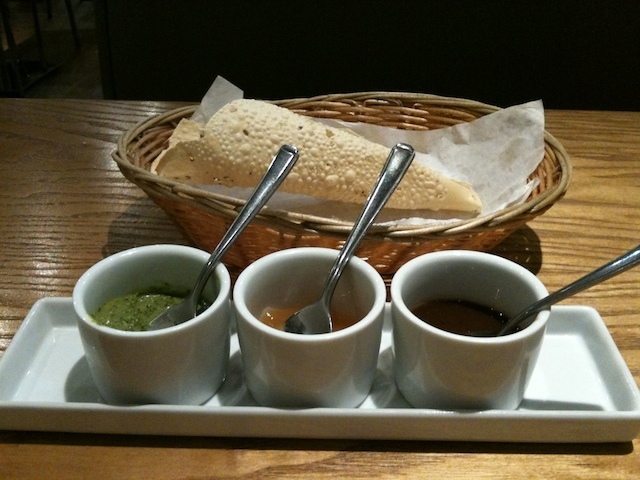 Salt’n Pepper, 32 Orange Street, Leicester Square, WC2H 7HQ. Tel: 020 7930 2939.